Happy FriYAY!! My first senior of 2019 is on the blog!! I was going to wait to share this session until next week, but today is so dreary, and these images remind me of the sunshine and dreamy light we had earlier this week. They brightened my day, and I hope they’ll brighten yours! I have to confess though, I was wearing a winter coat when these were shot on Monday, and sweet Amber’s teeth were chattering!! She took the cold like a champ though, and I am so glad she braved the chilly weather and ROCKED her senior session! I was so excited when Amber’s mom reached out to me again for photos. Originally, I wasn’t available and I was super bummed, but these guys held out (whether on purpose or not) and I am so happy we were able to make it work! I shot Amber’s sister’s senior photos a couple of years ago. Do you remember Kaycie’s session? Kaycie did Amber’s makeup for her session! Just like her sister, Amber’s model face game is STRONG. Seriously I didn’t even have to prompt Amber to get these fierce looks. Happy Wedding Wednesday, everybody! Oh my goodness, we are so excited to share this engagement session with you guys today. Emily is from Ohio and Dave is from Connecticut, and they actually met while Emily was a traveling nurse in Connecticut. Emily and Dave both told me when they met that they were not really looking for a serious relationship; Emily didn’t plan on staying in Connecticut for too long… but… before long they began to fall for each other. Totally unbeknownst to Emily, Dave planned out the details and asked Emily to marry him while they were on a cruise this past winter! They are back here in Ohio now! Happy Wedding Wednesday! Today I am sharing Brittney and Trey’s engagement shoot from Homestead Park! I love shooting at this park. I rarely do because it is about 45 minutes away, but I was so happy to drive out for this gorgeous couple! Brittney and Trey met on a soccer league team. Trey was on the team with one of Brittney’s friends and she asked Brittney if she would like to join too. Such a sweet story to how they met! My favorite part of their story though is the engagement. Trey had to work hard to get Brittney to the zoo. It seemed like everything was working against him that evening, but he finally convinced Brittney that they had to go because there was a special exhibit with penguins going on that evening (sadly, this was not true haha). Trey took Brittney on a walk through “North America” and to her surprise, he proposed at the bottom of the polar bear exhibit! If you know the Columbus Zoo and you’re an animal lover, you can imagine how beautiful and romantic this was, especially for two animal lovers! We’re baaaack! And so is Wedding Wednesday! We had a relaxing winter break, but are so happy to be back in the full swing of things around here. Look for lots of blog posts and wedding/engagement inspiration coming you way each week this Spring! We kicked off our 2019 wedding season with Courtney and Andy’s wedding last month! We had so much fun getting to know these two over the past year. They are high school sweethearts and their love is truly a real life fairytale. Happy Wedding Wednesday… erm… Thursday! Guys, my internet went down yesterday, so Wedding Wednesday has been moved to today! 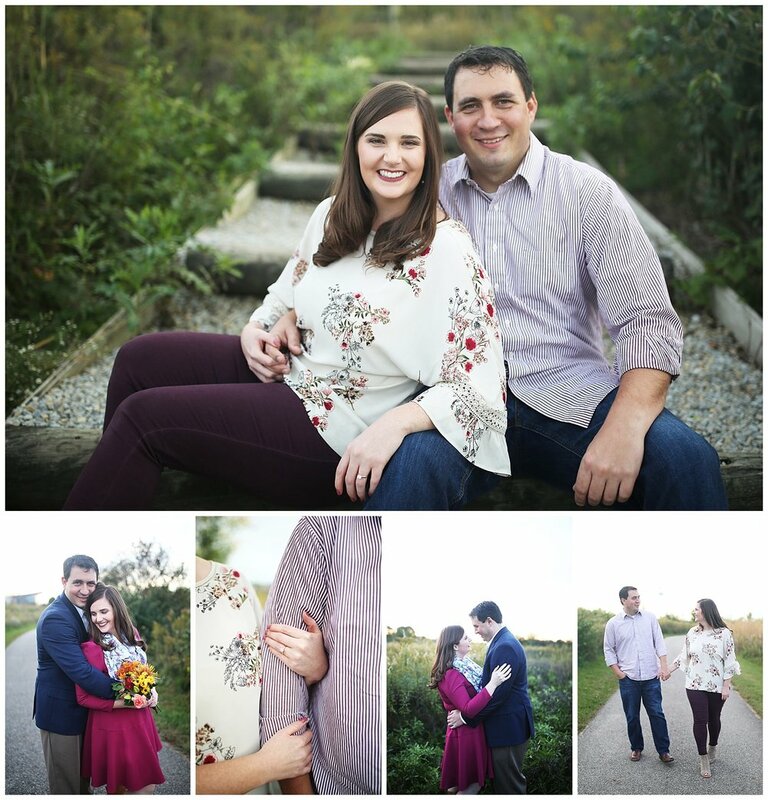 My last engagement session of the year (I feel like I’ve said this at least twice now…) and I am in love with this one! Brandie & Travis are both nurses from Nelsonville and when Brandie reached out to let me know their wedding would be in SE Ohio… ahhh I was so happy! My kind of people. I love getting to know the stories of my couples. This is why wedding and engagement photography is my passion. Your stories are my favorite! Brandie was telling me how much she and Travis have loved vacationing in Mexico while they were dating. On a recent trip, Travis was planning to propose and Brandie kept trying to change their plans, even ax the bag containing her future engagement ring (to make things easier, of course)! Travis managed to keep everything on track though and obviously succeeded with his master plan! Wedding Wednesday is back! At least for a couple more rounds this year. I am so excited for all of my 2019 couples!! It’s going to be an incredible year. I typically do not shoot on Sundays unless I need to use it as a rain make-up date, but Nick is in the military and was only home for a few days over Thanksgiving break, so we made it work! Baileigh and Nick were married this past summer in an intimate backyard wedding. Click here to reminisce their sweet wedding day! These two knew they didn’t want to wait any longer to get married, so they did it as soon as they could, surrounded by their closest family and friends. They are planning on having a big celebration next year and I am so excited to be photographing that as well! No more weddings for the remainder of the year, but today I am sharing a senior session! I photographed Matt’s senior session at the beginning of this month. I had so much fun wandering around Olde Pickerington with him, his sister, and his mom! I absolutely love this family. I started teaching Matt’s sister ice skating several years ago and quickly became friends with their mom! I have loved seeing these kids grow. And Matt has GROWN. I really cannot believe he is already a senior and will be graduating next year. I am so happy he has grown into such an awesome young man, getting his license and working a job. No hockey this year, but he played for the past several years. I love this family’s love for the ice! Happy Wedding Wednesday! I cannot believe we have made it to November! This os my last wedding post of the year and I am so excited to share this one with you all! It’s like the grand finale wedding for 2018! Annie and Taylor booked me over TWO YEARS ago and it has been such a fun time getting to know them both. Their wedding day was incredibly beautiful and I loved seeing all of their planning come together for their incredible day! We started off the day at Annie & Taylor’s place where the guys were getting ready, then we headed off to Annie’s parents’ house where the girls were getting ready. It was a gorgeous bright sunny day that started off a little chilly but quickly warmed up! After Annie was in her dress, we headed up to Nationwide Hotel and Conference Center. Happy Wedding Wednesday! Today I am sharing Kelly and Tyler’s engagement session on the blog! Oh guys, I this night was so beautiful and Kelly and Tyler were so amazing in front of the camera! Kelly and Tyler went to the same school, but they didn’t really know each other until their dads decided to set them up several years later! That’s right, their dads set them up: the cutest thing ever. They got engaged this past summer as the sun was setting on the beach! Last week of October! Where did it go?? October is to photographers what April is to accountants. The entire month feels like one really long week to me! BUT I love this and love getting you beautiful people in front of my camera. Today I am sharing Corrina’s senior session. Okay guys, this was a hard one to write. I started teaching Corrina ice skating when she was… I think twelve? She is now in her senior year at Pickerington North and making me feel my age. I am so proud of this sweet girl. She showed up to her senior session and she was by herself. I was like, “Did you come here alone? ?” She drove herself, in her own car, like a dang adult. I feel like this is a rare thing for people her age now. She has a steady job and is hoping to attend OSU next fall and study computer stuff that I don’t understand, maybe application development. Again, so stinkin’ proud of her. Also, she used to show up to skating practice half asleep and hair unbrushed and I’d be hollering at her and holy guacamole she shows up to her senior session with this sassy short hair cut perfectly fitting her personality, wearing makeup and I can’t take how beautiful. UGH.